PHP is a broadly used and open source scripting language that is especially suited for web development and can be embedded into HTML. It is an acronym for “PHP: Hypertext Preprocessor,” and it is most simple and quickly understanding programming languages. PHP generally runs on a web server, and it is a well-known programming language that is powerful enough to be at the core of the most significant blogging system on the web. Deep enough to run the most extensive social network, PHP is sufficiently simple to be a beginner’s first server-side language. Hence, a website can be built efficiently using PHP languages. Today there are many PHP training institutes in Chennai provides PHP training for the students. Hence, for an IT aspirant looking to learn the cutting-edge technologies, picking a PHP training institute would be the necessary job to get the best training. Begin your training from basics to advanced concepts and learn from experienced trainers. Hence, there is great demand for PHP Training, and therefore it would not be wrong to say that PHP development is a great profession to hold at present in this active city. It is challenging learning PHP development on own. It also requires being trained in order to master the specialty of PHP development for developing real-time applications or websites utilizing PHP. Joining professional PHP training from Zuan Education is would just help the purpose if you are want to learn this programming language. Zuan Education offers an opportunity to work on live PHP project, under the guidance of expert trainers. It will give you exposure to the practical challenges you confront while building up a PHP website or application. 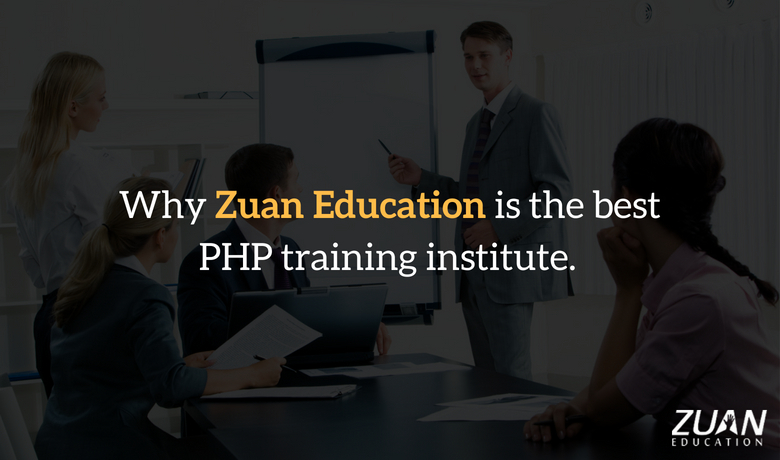 What makes Zuan Education stand out from other PHP training institutes in Chennai? Getting theoretical knowledge from other PHP training institutes is easy. Just the institute to offer hundred percent practical knowledge in Zuan Education which is essential to gain well-paid jobs. We intend to deliver essential PHP skills in a most cost-effective manner. Also, the students itself can experience all the training sessions by the tasks they finish. The students get opportunities to get in touch with the developers from Zuan Education. We also assist them to understand the existing business needs and emerging technologies. These kinds of interaction make the student’s knowledge dry, encouraging them to find more. We also provide placement assistance to the students who complete the course successfully. We serve you to sparkle better in your career. Why is Zuan Education the best PHP Training Institute in Chennai? Here are the valid reasons for why Zuan Education is best PHP training institute in Chennai. The faculties are industry experts having an experience more than 7 years in web development. Moreover, we have trained 1000+ professionals across various industries and corporate companies around Chennai. We are providing 100% practical oriented training with live projects. The interactive learning session will help you to learn PHP programming and directly work on projects by giving hands-on training. We are offering individual attention to every candidate for enhanced learning. Additionally, we are having excellent lab facility with high-end corporate infrastructure. Zuan Education offers different types of packages for PHP training course. From this package, you will get intensive training with basic concepts. It is a 12 days course with a certification. This package also covers basic modules with live project training. The students and beginners will get benefited from this basic level training. You will learn advanced PHP concepts from this advanced php training package. This package also provides course modules with advanced features. You will also get certification from this batch. The college students and Mid-level web developers will get benefited from this advanced level training. This package will help you to learn entire concepts of PHP. It also covers 20+ advanced modules, and you will get certification in Master of PHP from this package. The Graduates, Senior web developers, and Project Managers can benefit from this Master package. At our PHP training institute in Chennai, you will get excellent support from dedicated counselor to guide the entire session. If you have any doubts about course details, the supporting team guides you in a friendly manner. From the date of joining our PHP classes to until getting certification, the business development team will give excellent guidance to the students. We also provide flexible batches for PHP training in Chennai. You can choose your suitable batch type & convenient timing. Every batch has about 4 to 6 candidates. You can also take individual training with flexible timings. Weekday and weekend batches are also available for PHP training classes. You can utilize your weekends for the productive learning purpose. We provide interactive classroom sessions in batches with live project training for deeper understanding. We also provide online training classes for outstation candidates. The online classes are conducted through Skype & Teamviewer. We have updated course syllabus based on current industry demands across various disciplines. It has 16+ customized modules with industry rich curriculum. It also includes the core topics with specialization modules. We are one of the best PHP training institutes in Chennai offering the placement assistance to the students. We provide job placement assistance for freshers & job seeking professionals upon successful completion of our PHP training course. At our training institute, the internships are also available while pursuing a college degree. Our faculty’s career guidance will help you to land a good paying job. Don’t restrict your thinking. Think big and achieve bigger. We create skilled professionals by our PHP training classes. As commonly said, a goal without a plan is just a choice. If your goal is to join a reputed IT company, your plan should be to enroll at one of the best PHP training institutes in Chennai like Zuan Education. Hence, we help the students to accomplish their career dreams by providing them extensive practical training.